Just like everywhere else, trends come and go in the web design world. This rundown is for business owners and marketers and includes some of our favorites. This first post is all about multimedia and interactivity. Many trends got a start in 2014 and are building. Some you’ve seen before, but have been brushed off and cleaned up, and a few really are new. Some old print design ideas have also been freshened up for web. Not included in the the trends is making your site mobile-friendly. Mobile is not a trend. I can’t say it often enough. Mobile is NOT a trend. Accessing the web by smartphone is going to become more and more prevalent. More than half of Google searches are now on mobile (smartphones, not tables), and that number is only going to grow. In fact, among millennials, that number is closer to 90 percent. First up: Multimedia. It’s the biggest trend and growing daily. Multimedia is probably the biggest trend. It isn’t new, but it is becoming ever more important. Our short attention spans demand more than a page full of type and a video and multimedia engages us – Click here! Choose A, B or C! – in a way that simply reading a page full of type no longer does (if it ever did). Our own analytics show that people spend more time on a page they can engage with – video is big and getting bigger all the time, narrated slideshows, and animation are just a few possibilities. By animation I don’t mean the dancing bears that cut-rate ecommerce sites seem to love, but thoughtfully conceived and meticulously executed animations that explain and clarify a concept. Here’s how we used multimedia to enhance fans’ experience at a local 10K race that also happens to be a big party every year. For all race goers, it showed the course and how to get around. For the fans, it provided context to the race route and surroundings. 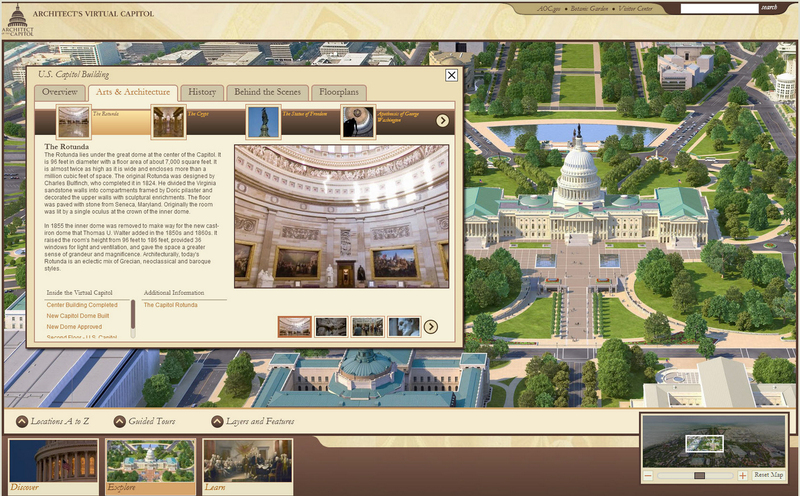 The U.S. Capitol uses multimedia to educate an audience that ranges from school kids to foreign tourists. (Disclosure: it’s a NimblePitch site, as is the interactive map created for the 10K, above.) A Spacecraft for All is a completely engrossing site that invites the public’s engagement with a satellite. Who knew satellites could be so much fun? Seattle took a different tack than the standard civic promotion site to tell their story of an international landmark. To increase engagement with your site, include as much interactivity as possible. Start with video and take off from there. Use your imagination and see where you can fly. Up next: Big and Bold is Beautiful!